This weekend, the Burlington Book Festival ignited a bit of a firestorm when it announced that it had invited former A Prairie Home Companion and Writer’s Almanac host Garrison Keillor to the festival. Billed as “A Few Words with Garrison Keillor,” the festival trumpeted his “signature blend of humor, charisma and wisdom,” with tickets running anywhere from $45 for general admission to $75 for a meet and greet after the show. It was an idiotic, unforced error, given that Keillor had been fired from his roles after allegations of inappropriate behavior, and an MPR investigation uncovered a lengthy history of misconduct. The announcement wasn’t exactly met with open arms: the Burlington Book Festival’s Facebook pace received a number of angry comments, and its sponsors, like Vermont Public Radio, and the Vermont Humanities Council distanced themselves from the invitation, while another, Literary North, pulled out entirely. The purpose of bringing in Keillor, it seems, was to fundraise, and the justification was that Keillor is a well known figure will help bring in money. But in doing so, Kisonak absolutely dismisses the accusations, and by extension, the accusers who came forward in the first place. “I have never invited a sexual predator to the Burlington Book Festival and never would,” Kisonak writes, seemingly ignoring the widespread reporting done by Keillor’s own home NPR affiliate, and goes on to say that “Garrison Keillor is not a sexual predator,” saying that people have been conflating what he did with the likes of Harvey Weinstein and Bill Cosby. Speaking to VPR, Kisonak noted that “No insensitivity to anyone was ever the intent.” When is it ever? This is pretty stunning, and literally made my jaw drop when Taylor Dobbs of Seven Days asked me for some thoughts. It’s a really horrid and idiotic justification for bringing Keillor in. To be clear, there are differences between Weinstein, Cosby, and Keillor’s behavior. But Keillor still engaged in inappropriate behavior for which he was fired. Because there are worse examples out there doesn’t mean that it’s worth ignoring seemingly lesser charges. Ultimately, the combined outcry culminated yesterday with Keillor’s disinvitation. But the damage has been done. As I noted on Twitter, the men accused of sexual misconduct across industries largely haven’t gone away. Bill Cosby is currently sitting in prison, Harvey Weinstein is being investigated, but others, like Louis C.K., and Aziz Ansari have been probing the waters for their own comebacks. Garrison Keillor is as well, and Kisonak just played into this larger narrative: the #MeToo movement could very well turn out to be a temporary speed bump for most of the men accused of misconduct, something that they simply wait out, and get back on with their lives, while the people they left behind in their wake still have to contend with the damage. At the end of the day, what is most infuriating about this isn’t that Keillor was invited to the festival — although that was a particularly dumb move — but Kisonak’s dismissive defense of it, highlighting a tone-deaf line of thinking behind the event and its reception. I’ve presented at the event before, but after this, I can safely say that I’ll never present there again. Vermont Comic Con is over. With Jason Moulton and his partner Natasha Durand announcing their retirement in a heated Facebook Live video yesterday, one of the major meeting points for Vermont nerds is gone. That’s not necessarily a bad thing: it opens the door to new events in the state, and removes a bit of angst from Vermont geeks who feel that they’ve been alienated from the convention. I’ve been going to the con since it started, and Jason has been generous over the years with providing space: first to a half-assed booth for this blog a bunch of years ago, and more critically, to the 501st Legion, which was instrumental in the formation of the Green Mountain Squad in 2015. Without this event, we wouldn’t be where we are today, and we’ve been thankful that Jason provided the space when he did. It led to some cool things, like getting to interview the then-Star Wars Episode IX director, Colin Trevorrow, and Hawk Otsby, writer for The Expanse. It’s also been a place where I’ve been able to run into friends from around the Vermont geek community. But in the aftermath of the announcement — in which Jay and Natasha scolded businesses in Barre for … not promoting them better (?) and for not being appreciative enough for bettering the city — there’s been an outbreak of chatter from around the various online watering holes for all things Vermont. A number of people have pointed to how Jason alienated many people: comic book creators and guests from out of state, major vendors and tent-pole stores around the state, cosplay groups, and individuals. I wasn’t able to attend this year (or last year — the 501st decided not to participate), but the pictures that I’ve seen show off an extremely sparse show that was just a shell of what it had been when it was founded back in 2014. It’s a shame, because the event could have gone the other way, and become a much better, inclusive production that showcased the best of what Vermont had to offer. The biggest problem that I’ve had with the convention has been that it’s never really felt like it’s been fully representative of the state’s community, but more of a standard-issue comic book convention that’s been plopped into Vermont. For sure, there’s been local organizations, vendors, and fans in attendance, but it never really felt like a “Vermont” thing. While the con wanted to be the face of Vermont’s geek community and to build it up, it never felt like they made the right outreach to the broad swath of the fans that were there. Then and now, Jason was an outsider (first from New Hampshire coming to Vermont, then from Fairfax coming in to Barre) coming into an existing community, and sought to co-op it for his convention, rather than bring in people who better knew the local scene. I’ve been to big conventions over the years, and they’re all pretty much the same: big geek flea markets with some high profile guests. VTCC was just this on a smaller scale, aiming to be bigger, but lacked the geographical muscle to really become something like Granite State Comic Con or Boston Comic Con. Conventions are huge projects, and while I appreciate Jay and Natasha’s time and energy spent in setting up such an event. But yesterday’s broadcast really felt… petty: it essentially devolved into a rant about how the city of Barre and Vermont’s geek community failed them, and didn’t make the show better. But from talking with folks in the state over the last couple of years, Jay certainly needs to shoulder some of that blame himself: he burned numerous bridges with many groups and organizations over the years, either because of his way of doing things, refusing to pay vendors / artists / web designers, or because people were just put off by costs and what was offered, and ultimately made a cost/benefit analysis that didn’t work out in the con’s favor. Vermont has a lot to offer for its nerd residents, and there’s plenty of institutional gatherings for them to go to: Bakuretsu Con is taking place in October, while Carnage will kick off in November. There’s the entire ecosystem of events put on by Vermont Gatherings, the Champlain Games Festival, Ghostacular Paracon, and more. There’s the gaming events put on by the Green Mountain Gamers, including their quarterly gaming micro-cons, and whenever we get back around to it, GMS’s own VT SF Writer’s series. But while there’s been tittering that Vermont’s fandom community is about to die, I don’t think that’s accurate: this site has been around since *checks calendar, gasps, faints* 2010, and it’s been archiving, reporting on, and commenting on Vermont’s fan community in that time. Vermont’s fandom community has been around for a long, long time, and it’s not dependent on one event, even though losing a VTCC is kind of a bummer. Hopefully, we’ll see something fill the hole that it leaves behind — an event that covers all manner of fandom, from Vermont’s writers, comic book artists, cosplayers, filmmakers, gamers, and the fans who love what they produce. Geek Mountain State had its best year ever in 2014, with 813 posts published, and with a total of 33,750 views, a nearly three-fold-increase in the previous year, and with almost double the number of posts published. We also began to branch into our own events: the Vermont SF Writer’s Series found its legs last year, while we started discussing science fiction and fantasy novels at the Pierson Library. 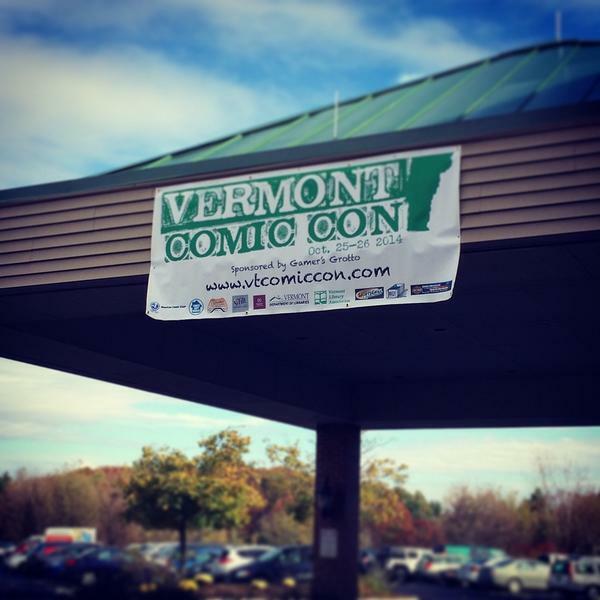 We also took part in the first ever Vermont Comic Con and last year’s Burlington Book Festival. The site also began to receive coverage from state-wide media, such as in Seven Days, Vermont Public Radio and WPTZ. We saw some outstanding things happen this year when it comes to geek things: Books from Brian Staveley and Daniel Mills, Vermont’s first Comic Con (in recent memory), the opening of Tilt Classic Arcade and Ale House, in addition to a whole host of other things that demonstrate that Vermont is a truly geeky place to live and work. Behind all of this is the whole host of new (to the field and to us) authors, such as Aimee Picchi, Ginger Weil, Pat Esden, Kane Gilmore and many, many others who produced a number of stories for us to enjoy. We’ve got a lot of ideas for what 2015 is going to bring, from new events and some new things that we’re starting to plan out and consider for the site. Stay tuned, and thank you for reading! Over the weekend, Geek Mountain State (myself and a couple of hapless and selfless volunteers), had a table at Vermont Comic Con, which exceeded our expectations nicely on Saturday and Sunday. With this first year of the convention, we weren’t sure exactly what to think: was this simply the workings of an outside company trying to force a standard-grade Comic Con into Vermont, or something that would ignore most of Vermont’s vibrant community of artists and creators? Without the longer track record that other conventions have (such as in the major media markets of New York City and Boston), it was hard to tell. The convention was a fun time, mixing the typical ‘Comic Con’ elements such as Cosplayers and vendors with some good local offerings, such as Tilt Arcade’s game machines and the Vermont Library Association’s booth. We were perfectly positioned next to Gamer’s Grotto and chatted with a number of existing GMS followers and people who were simply curious about what we were up to. Walking the convention floor, we were happy to see a number of local artists and authors selling and presenting their artwork, and a ton of local superheroes, fans and gawkers wandering back and forth over the two days. What was fantastic to see was a sort of vindication for us and our mission: ‘Geek’ culture is alive and well in Vermont, and events such as this have the ability to pull in a number of people. From all reports, the convention did extremely well, with a crowded two days on the convention floor and game rooms. It’s also nice to see the various elements of Vermont’s geek scene come together: Brap’s Magic put together an extensive gaming schedule, costumes were out in full force, and elements of the state’s cartoonist/artist community were present. One thing that we were very thrilled about was the people who stopped by who had heard about us through various ways and means. We talked to countless fans who were interested in the site, converted a few more followers, but more importantly, met a ton of new people: we’ve formed a number of new links to people, which is very exciting: we can’t wait to see what they’ll be up to in the coming year. It’s clear that this was a first-year effort, and the convention will have some things to work on in the coming year: the convention’s website is… painful, to say the least, with little information for vendors until the last minute, and with some copy editing issues. There were a number of artists present who weren’t listed, and as a result, we came across a number of pleasant surprises wandering around. These, however, are pretty minor issues. There were some glaring omissions: mainstay stores such as Quarterstaff Games wasn’t present (although they had a game day across town) at all, while there didn’t appear to be any official presence of the Center for Cartoon Studies, which is a major force in the cartooning world right here in Vermont. Hopefully, we’ll see them next year. Some additional programming wouldn’t be a bad idea either. As a starting point, it looks like it was a success: the convention organizers have already indicated that they’ll be back next year (Labor Day 2015 is the new date). There’s certainly a lot of potential for them to grow and expand over the coming years, and that potential has us incredibly excited to see this become a mainstay here in Vermont. For our part, many thanks to Megan, Ian and Matt for helping to man the table this year. Next year? We need a banner.